Enforced limits of micro blogging services and following rise of URL shorteners had diluted links from something unique into something vague. It is no longer possible to precisely look up mentions of specific link. BackTweets service tries to turn situation backwards and allows to search for original links under layer of shortener wrappers. Service take link as input and shows all tweets (in backward chronological order) that link to that URL, either directly or through link shortener. For root links all results are returned – both for home page and rest of site. Advanced search allows to limit output with time frame. API for developers (free, but requires registration). Search lacks filtering options. Bots that retweet automatically can (and do) easily clutter results. For myself I had solved that with filtering results in FeedDemon. Straightforward and efficient service that does excellent job with taking URL wrappers out of equation. 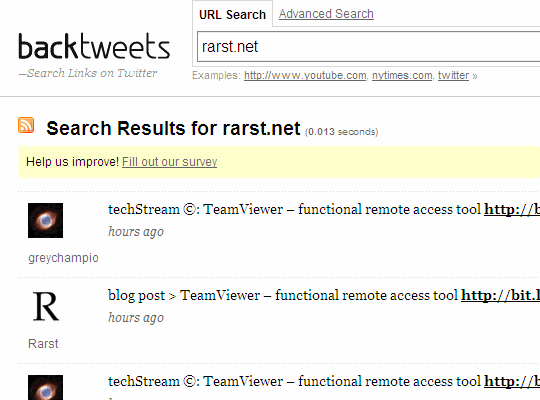 Even if you don’t use Twitter yourself this is still good tool to get tweets, relevant to link.